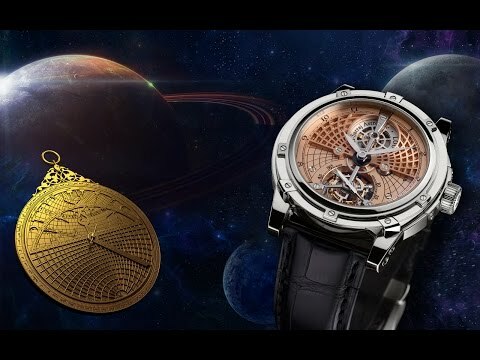 The Astrolabe Tourbillon is inspired by one of mankind's oldest but least-known astronomical instruments. An astrolabe is an instrument used to observe the stars as well as determine the time (in the daytime by observing the sun, at night by observing the stars). It is a mythical object, which links man to the great mysteries of the universe. The ASTROLABE Tourbillon is presented in an exceptional 18K white gold case composed of 59 different components and equipped with the Louis Moinet signature crown guard. The latter invention consists of an independent stem integrated within a watertight system and held with a plate secured by four screws. It represents a major advantage in facilitating servicing, compared to traditionally soldered stems. The view through the ASTROLABE Tourbillon display-back is almost as spectacular as the dial side, with the ‘octopus spring’ of the winding and setting mechanism taking centre stage. This ingenious component is effectively three springs in one – pull-out piece spring, lever spring and click spring – all radiating from the centre like the swirling legs of an octopus. The movement is engraved with Louis Moinet's Côtes du Jura motif. Astrolabe Tourbillon is available in a limited edition of 12 pieces.